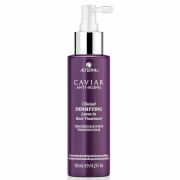 Alterna CAVIAR Replenishing Moisture Milk is a nourishing leave-in conditioner spray designed to transform weak, brittle hair into strong, hydrated, and healthy-looking locks. 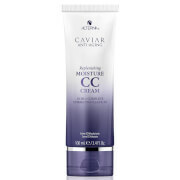 Specially formulated for aging hair using a proven formula containing caviar extract, vitamin C, and a blend of nourishing botanicals, this premium stay-in conditioner features the same proven ingredients and technologies as Alterna‰Ûªs top-selling CAVIAR anti-aging Replenishing Moisture Shampoo and Conditioner. Spray throughout clean, damp hair. Style as usual. Can be used in place of in-shower conditioner on fine hair, or as an additional conditioning step on medium to thick hair textures. Water (Aqua), Dimethicone, Propanediol, Cetearyl Alcohol, Glycerin, Behentrimonium Chloride, Dicaprylyl Ether, Sea Water (Maris Aqua), Kappaphycus Alvarezii Extract, Polyquaternium-55, Cyclopentasiloxane, Dimethiconol, Panthenol, Cetrimonium Chloride, Selaginella Lepidophylla Extract, Lactobacillus Ferment, Amodimethicone, Superoxide Dismutase, Polysilicone-15, CaviarExtract, Ascorbic Acid, Saccharomyces/Magnesium Ferment, Saccharomyces/Copper Ferment, Saccharomyces/Silicon Ferment, Saccharomyces/Zinc Ferment, Saccharomyces/IronFerment, Phospholipids, Helianthus Annuus (Sunflower) Seed Oil,Sodium Methoxy PEG-16 Maleate/Styrene Sulfonate Copolymer, Tocopheryl Acetate, Butylene Glycol, Algae Extract, C11-15 Pareth-7, Laureth-9, Trideceth-12, Citric Acid, Disodium EDTA, Phenoxyethanol, Methylisothiazolinone, Fragrance (Parfum). This is more of a cream than a spray. I spray it in my hands then apply to my hair. It may be difficult to evenly cover your hair and not over apply if you spray it directly on your hair. It is a good detangler and hydrates my ends nicely. If I wear my hair straight or curl it, I need to apply a heat protectant too with this product. I haven't noticed any strengthening of my hair with this product though, but my ends do appear smoother. I like this product. It gives moisture without feeling heavy. 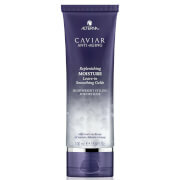 I use the Alterna volume shampoo, as well. 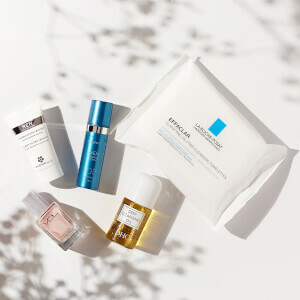 All great products. Just noticed the previous reviewer says this product can be sprayed, but mine come out like a light cream that I apply with my hands. This leave-in is quite nice but still not worth the price. It can be sprayed on but I chose to spray into my hand and apply. Pleasant enough, works well but not a miracle product. I have thick, dry, color treated hair. This did not weigh my hair down nor leave a greasy feel.